First of all it will be interesting to see how many folks get turned away. With only 78,ooo seats available tomorrow and record crowds for this event thus far under Kirby’s watch, ain’t everybody gonna get a first hand look at Justin Fields arm and Holyfield’s legs. Regardless of seating arrangements and availability, I think the first thing I want to see is how well the middle of the field is covered by our defense on passing downs. You see, one does not just replace a player like Roquan Smith. It’s impossible. But I have great confidence that the coaches have recruited talent behind him. So I’m confident that we have someone that can blitz through the heart of the offensive protection. Afterall, the name Natrez Patrick comes to mind. And I’m confident we may have someone that can defend the field laterally from sideline to sideline. But what made Roquan so very special was how well he defended the middle of the field in passing situations. He could cover a tight end. He could take away a slot receiver’s crossing route. 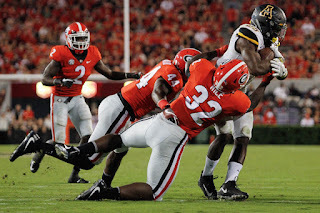 And there was nary a team that would dare to throw a middle screen in front of Roquan Smith. In other words, opposing quarterbacks had a lot to process at the line of scrimmage when they looked across and saw Roquan staring at them. Were Monty Rice and Nate McBride paying close attention? I hope so. And again, I have full confidence that the coaches have recruited the right players. Because it’s been since before the disgraceful John Jancek linebacker coached era that we could defend that area of the field on any down that effectively. I miss Roquan a lot already. I’ll miss him a lot more if we see a lot of successful seam routes and crossing patterns. Elijah Holyfield should have himself a day. The fans aren’t the only ones I suspect that want to see how he manages 20 or so touches in a game(like) situation. Pass protection. Kirby says it is structured to be a quarterback’s game. As nice as it is to have a true sophomore quarterback that lead us within a breath of a National Championship, I think everyone would be thrilled if Justin Fields made some plays. Still, in a spring game it’s hard to gauge things like pass protection. However it will still be something to keep a close eye on. And not just for the obvious reasons of seeing how the coaches rotate tackles and guards. We lost two absolutely amazing pass protection runnings backs in Chubb and Michel. Holyfield and Herrien have big shoes to fill as (probably) the only scholarship backs available tomorrow. We know Fromm can hurt teams with his arm as well as his legs if need be. And we suspect Fields will eventually be able to do the same to opposing teams’ defense. But we’ll need to have solid pass protection, and that sometimes means a small running back stepping up into the path of a blitzing monster. So perhaps we can at least see some of these punters under rushed conditions. And those are a few things I’m watching for, in addition to seeing some new guys that have supposedly stepped up big thus far, like Brenton Cox and Cade Mays. What’re you ready to see from some football in April? Jake Fromm - sophomore slump? ?...not likely.